We've been impressed by one or two T A products recently, which tend to present a singularly hi-tech face to the world and contain some impressive engineering. This tuner is no exception. Fit and finish are superb and the unit has a very professional air all round. It's simple and pleasant to operate, with the exception of manual tuning, which we found a bit of a bore. But, once you've loaded your favourite stations into the presets, it's all quick and easy. RDS helps keep track of stations, too. Within the case, construction is as smart as on the outside. The circuit board carrying the main RF and audio blocks is positioned away from the back panel and linked to it by cables of a few inches length - we've some slight reservations about the use of a phono connector on the link from the aerial socket! This board is quite small, very neat, and loaded with a tuner head from Kwang Sung and chips from Sanyo and Philips, the latter decoding RDS while the former handle audio. The power supply features a generous mains transformer shielded in copper-plated steel, but otherwise is typical of those fitted to the other tuners in the group. Electronically then, this looks quite similar to the other models in the group, but it does have two features on the RF side that can help optimise reception under marginal conditions. First, a bandwidth control that when set to 'Narrow' can help exclude interference from nearby stations or multipath distortion, plus an attenuator which helps prevent overload if there is a strong station nearby. Both useful with crowded airwaves. 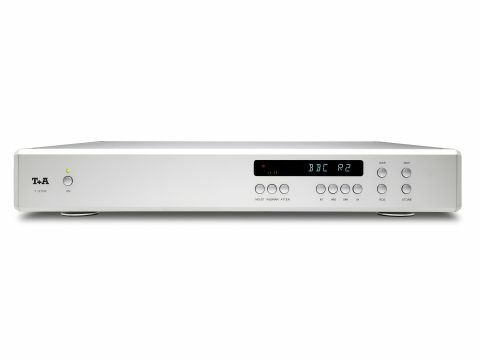 This tuner faces some stiff competition in the group from cheaper models, but although it didn't blow away the Cyrus and Rega offerings, the T1210R did put in a performance which equalled either of them in any area and bettered them both in some. For a start, its bass is really very solid and extended, reaching the lowest frequencies but always immaculately controlled and as a result taut and rhythmic when need be. Treble is clean and nicely open too, with a good deal of air around delicate sounds, but the real deciding factor in this tuner's favour is its midband, which is by a small but significant margin the clearest and most detailed of the group. It is not absolutely devoid of coloration - on occasion we heard hints of lower-mid hollowness - but it's pretty close and it offers some of the best detail and imaging we've heard from the airwaves. Just now and then Radios 2, 3 and 4 particularly, will put out a broadcast with some fine imaging depth and frankly there aren't many tuners that can make the most of that. Depth, after all, is a hard trick for CD players and amplifiers to get right and on FM there's arguably a good deal more to go wrong. Even so, this one makes a very good stab at it, surpassed only by a couple of reference tuners (both expensive, long out of production and somewhat tweaked) in our cupboard. In no one area is this tuner obviously superior to the others, but on the whole it equals or exceeds all of them in each detail. Distortion is low under any conditions, rising by a modest amount when only one channel is driven and noise is really much of a muchness with most of the others in terms of both level and spectrum. Meanwhile, suppression of pilot tone and distortions above 15kHz is good but not devastatingly better than the rest can manage. Channel separation is weak by modern standards, but while we're used to seeing very high figures for this from CD players, LP never managed to beat even a so-so FM tuner and still achieved good imaging, so it's probably not a real limitation. Frequency response is very flat; within two tenths of a dB to 10kHz and less than 0.5dB out at 14kHz. Finally, the 'Narrow' tuning mode gives less increase in distortion than is often the case, making it more generally applicable.